Representative Honours: Northern Ireland: 1 Full Cap (1989); League of Ireland Caps. Club Honours: (with Derry City) League of Ireland Champion 1988/89, 1996/97; FAI Cup Winner 1988/89, 1994/95, 2002, Runner-Up 1993/94, 1996/97; Football League of Ireland Cup Winner 1988/89, 1993/94, 1999/00 (with Glentoran) Irish Cup Winner 1995/96. Awards: FAI National League Player of the Year 1995; PFAI Player of the Year 1994/95; PFAI Young Player of the Year 1988/89. Liam Coyle burst onto the League of Ireland scene during the 1988/89 season. He scored a hat-trick against Cobh Ramblers on his debut, was crowned Young Player of the Year, finished the season as “Treble” winner with Derry, and was capped by Northern Ireland in an end-of-season friendly with Chile (following in the footsteps of his father, Fay). He was unlucky not to mark his international debut with a goal, his header from a corner forcing a superb save from the goalkeeper. The following season started brightly too, as Coyle starred in a European Cup first round tie with Benfica at the Brandywell. Benfica manager Sven Goran Eriksson immediately offered to sign Coyle on a six-month loan deal, and Manchester United were also set to make a bid. A serious knee injury however ruled Coyle out of the second leg in Lisbon. Further investigations revealed the extent of his condition – he had Osteo Necrosis, and doctors warned that if he played again he could be confined to a wheelchair. Essentially Coyle’s career was over at 21 years-old. Derry played Newcastle United in a benefit match for the young striker, but he refused to believe that he would never play again. He travelled the world and was treated by the top consultants in their field. 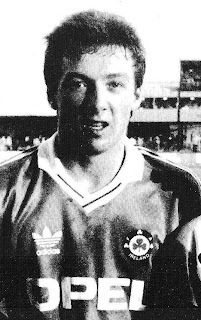 He made an abortive comeback with Coleraine in September 1990, but lasted just one match. Coyle then turned to a faith-healer, and in combination with heavy knee strapping, made an impressive impact on the Irish League with Omagh in the 1992/93 season. Coyle returned to Derry City in August 1993, and soon enough was showing the skills and trickery that had brought him such acclaim as a youngster. 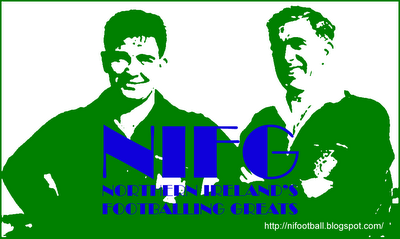 He added further FAI Cup and League Cup medals to his collection, and was Ireland’s double player of the year in 1995. In December 1995 Coyle moved to Glentoran in a £35,000 deal, a record between Irish clubs. He was unhappy about leaving the Brandywell behind and would later describe it as the "low point" of his career. He lasted just six months at the Oval, picking up an Irish Cup medal, before being allowed to leave. Glens’ manager Tommy Cassidy put it like this, “(Coyle) is one of the most skilful Irish players in history, but he had to go - he was missing training and other players were taking note”. Coyle returned to Derry City for a combined fee of £42,000 (that also included Declan Devine), and immediately helped the Candystripes to another League of Ireland title. As the years moved on Coyle continued to regularly find the net until the injuries began to take their toll. In 2002 he scored his only FAI Cup Final goal in his fifth appearance, as Derry defeated Shamrock Rovers 1-0. His last ever goal for the club proved to be even more important. In December 2003 Derry found themselves in a promotion-relegation play-off with near neighbours Finn Harps. With the game in extra-time it was the 35 year-old Coyle who came off the bench to score the winner, and maintain Derry’s Premier Division status. In January 2004, following years of playing through the pain barrier, Coyle announced his retirement from playing. He had scored a modern-day club record 113 goals in almost 400 games for Derry, and was acclaimed from all-quarters as the greatest player in their history. He stayed at the Brandywell as Chief Scout, and has since made clear his ambitions to one day manage the club. Coyle is pictured above wearing League of Ireland shirt for an inter-league match against the Irish League. Representative Honours: Ireland: 12 Full Caps / 2 Goals (1921-1931), 1 Amateur Cap / 1 Goal (1921); Irish League: Caps. Club Honours: (with Belfast Celtic) Irish League Champion 1919/20; (with Distillery) Belfast Charities Cup Winner 1920/21; County Antrim Shield Runner-Up 1920/21. A native of Bessbrook, Jimmy Chambers was spotted by Belfast Cetic playing in the Newry & District League. A "nippy winger, able to perform equally well on both flanks", he aided Celtic to the Gibson Cup in 1920 before they withdrew from the Irish League. Chambers then joined Distillery. It was as a centre-forward that Chambers made his international bow in 1921, finding the net in Ireland's 2-1 defeat by Wales. That same season he played for the Whites in both the Co. Antrim Shield and Belfast Charities Cup finals, finishing with a winners' medal in the latter. 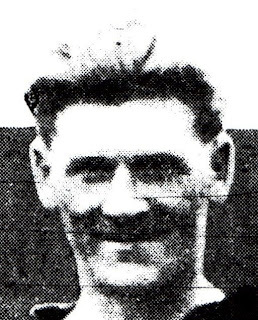 Chambers moved closer to home with Newry Town and won Inter-League honours in the 1923/34 season, the club’s first season in the Irish League. He finally took his chances across the Irish Sea when signed by Bury in 1925. Although he added a further eight caps during his time with Bury, Chambers struggled to make an impact in the Football League, playing just 28 games in six seasons. 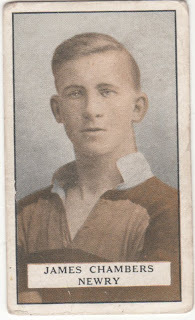 A move to Nottingham Forest in August 1931 brought a brief resurgence in Chambers' international career, and he added three caps during his time at the City Ground. Injuries began to affect his game, and Chambers left Forest after just one season. 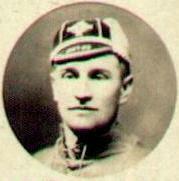 In a ten year international career, Jimmy Chambers won 12 caps, and scoring twice. 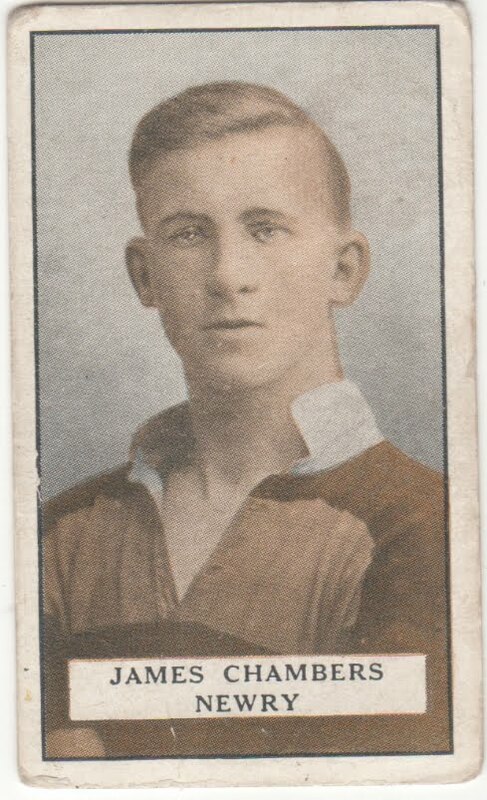 The highlight of his career was undoubtedly his role in the 7-0 crushing of Wales in February 1930, the match in which Joe Bambrick scored six times. Summary: 12/2. Won: 4, Drew: 1, Lost: 7. * Chambers has traditionally been credited with this goal but it has since been established that Sammy Curran was the scorer. With thanks to Red Warrior from the ILS Forum.